Hope you all had a good day, especially those like us, stuck in the ice. I know we’re fortunate in where we are, with access to facilities just up the lock. Some are not so lucky, but are coping. We had a very pleasant evening with George and Carol on Christmas Eve just before a night of -25° C! I’m glad I wasn’t buzzing around on a sleigh. I wonder if Santa has cab heating? It’s going to take some time and warmer temperatures before there’s any serious movement around the network. The ice on the sections that have been untouched for over well over a week now must be 4 or 5 inches thick. We didn’t have snow but there was still plenty left over from earlier in the week. Does “old” snow count for a white Christmas? 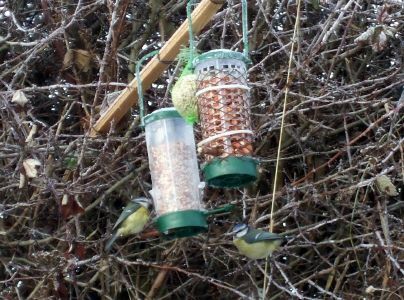 The birds have enjoyed having us here, all three boats have feeders out, attracting all sorts. A pair of Grey Wagtails are getting very tame. They mooch about near the waste pipe from the galley sink, hoovering up any food scraps from the washing up. I guess they’ll miss us when we’re gone, but they should have access to their normal foraging then. Meg is pleased that we’ve found a suitable field for ball throwing….. It's here at last, kids! Now where did I put that corkscrew? That’s it, it can only get better from here as the days start to lengthen! We’ve been a bit up and down these last couple of days, up and down the lock. Most of Sunday was spent shuttling boats through the ice. We went up first. As we’re facing the right way it was easier for us to break through with the sharp end. Still not that easy, though! 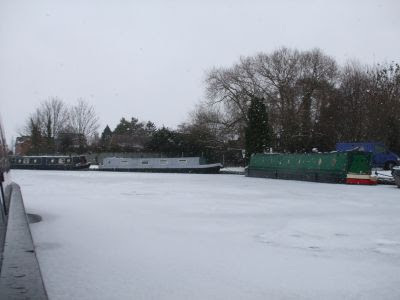 After defrosting the water tap we filled the tank, then emptied the loos before dropping back down the lock in reverse. 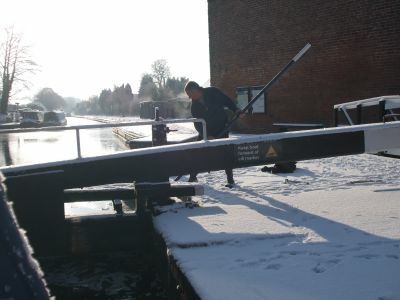 Chas was next on M2L, reversing through the ice floes and onto the wharf for diesel then across the cut for water. Meanwhile George brought R’n’R also backwards, to do the same. They both have oil heating, so use more diesel than us. It had been a fine sunny day, but got decided parky when the sun went down. (Not that it got up much, anyway). Yesterday was not quite so active, we were the only ones to go up again, this time to meet Tescoman for our delivery. Even after just one night, the ice was pretty thick again, in some cases worse as the slabs of ice we’d displaced on Sunday froze on top of the new stuff. There was a bit of excitement up on the road late yesterday afternoon. 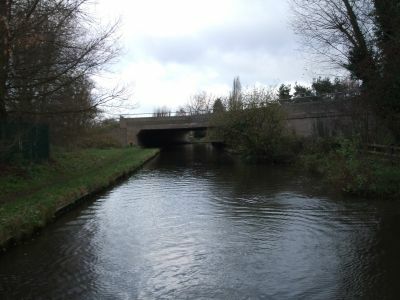 Watling Street (now known as the A5) crosses the canal just this side of the lock. There’s a lay-by near the bridge regularly used by trucks, but one won’t be going any further, at least not under it’s own power. 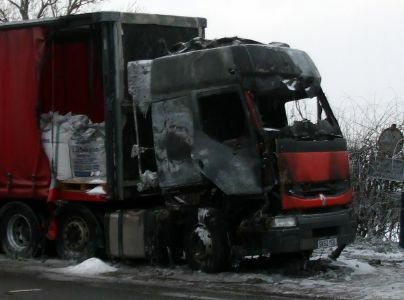 No-one was hurt and the emergency services were on the scene promptly. 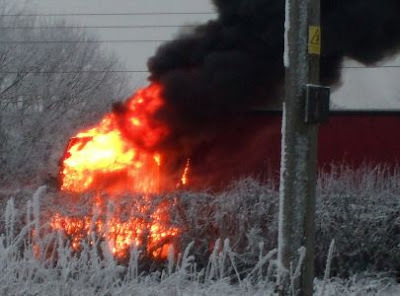 The road was closed for about an hour while the blaze was brought under control and made safe. The truck is a sorry sight this morning. The temperatures have been steadily rising after a very cold Sunday night. It barely dropped below freezing last night, but on the other hand it’s not much above now. It’ll be a while before we’ll be moving any distance at this rate. Locks - 4 (arguably), miles - a little bit of one. I’m glad we decided to move on Wednesday, instead of leaving it another day. By noon yesterday it was throwing it down. 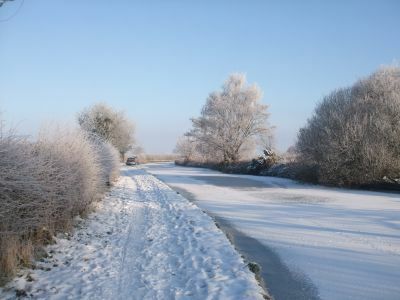 By late afternoon most of the ice seemed to have disappeared, but then the temperature plummeted, the canal started to skin over, and by morning we were confronted with quite a familiar sight. 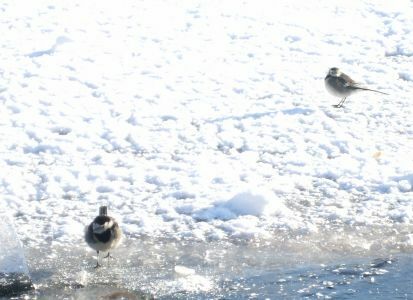 The ice is only ¼ inch thick at the moment, but with sub-zero temperatures forecast it’ll build up fast on the cold water. Looking back at the straight alongside the motorway. This was the hardest section on Wednesday. 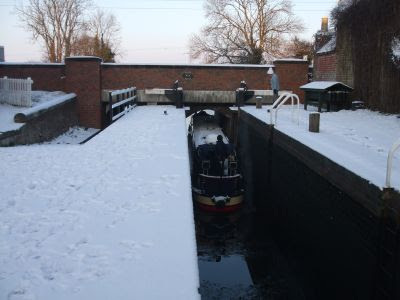 Conditions permitting, we intend to go up Gailey Lock again on Tuesday, to meet Tescoman for a large grocery order, fill with water, empty the loos and get a bit more solid fuel from the wharf. That’ll last us till after Christmas. We’ve got the bird feeders out in the bushes, and I’ve built a small platform for the ground feeders, too. Blackbirds, bluetits, robins and sparrows are regulars already, and we’ve a grey wagtail eating bread and birdseed off the ice alongside. Must be a bit of a snob, not mingling with the rest. We’ve yet to see the local kingfisher, with the water iced over again he’s probably hunting elsewhere. Crash, Bang, Wallop, what a picture…. Well, we made it to Gailey, although we nearly gave up a couple of times. 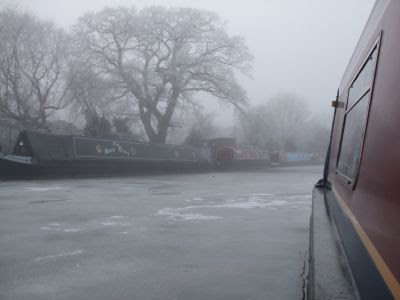 The ice wasn’t too thick as we left the moorings in Penkridge after shopping and saying our goodbyes to Rita and Scooby on NB Festina Lente, and Mrs Ian across the water on Tom’s Moorings. It started to get thicker as we left the built up area, towards Otherton…..
And got thicker still as we swung parallel to the motorway. We couldn’t hear the traffic over the crack and crunch of the ice. Ann and Charles walked down to meet us near Otherton Lock, the “off-boat” pictures are hers. Thanks, Ann. 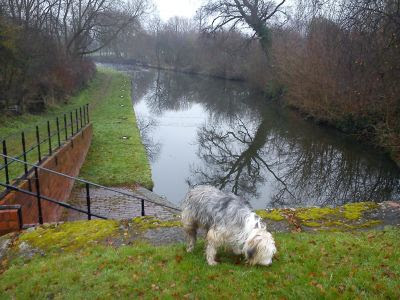 Meg jumped ship at Otherton Lock; she’d had enough of the noise and shaking by then. But she waited for us at each subsequent lock. 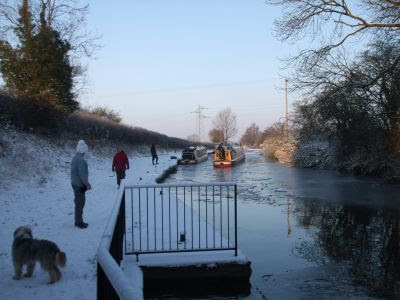 It was a bit easier going around the Rodbaston, Boggs and Brick Kiln Lock areas, where BW had been dredging, breaking the ice as they went. Then around one last bend and the welcome sight of the Gailey Roundhouse could be seen on the skyline. Gailey, with Moore2Life and Rock ‘n’ Roll moored below. We went up Gailey Lock, filled with diesel at the wharf, then across the cut and filled the water tank and emptied the loos, before reversing back down the lock and mooring near M2L. We’ll wait out the weekend’s bad weather here, then see what it’s like. We’ve Tescoman coming on Tuesday morning, so can’t set off before then, anyway. It’s a relief to be here, with full and empty tanks as required. It’s an easy trip up the lock and back to fill up again, so we’re OK here for as long as it takes. And the towpath is quieter! Still, at least we’ve a different view through the windows! Thanks for the good wishes, Sue. They seem to have worked! Unlike Tesco.com! 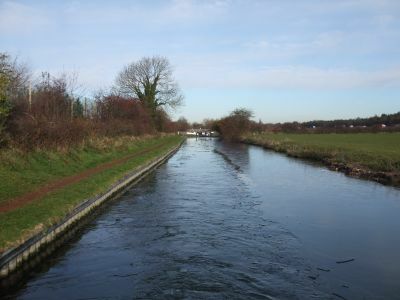 Locks 7 (1 twice), miles 2¾. AT LAST!!! 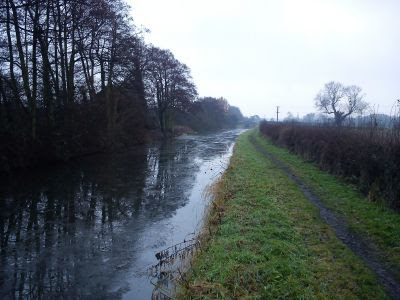 I‘ve been up to Gailey today, following the towpath, checking on ice conditions. Some places are almost clear….. While others look quite thick. After coffee with Chas and Ann, and a chat with George as well, we’ve made the momentous decision to attempt to get to Gailey tomorrow. All being well we’ll join them there mid afternoon. It could be quite a slow trip, but at least all 5 of the locks are clear of ice. I’m really looking forward to it, 17 days looking at the same scenery is not conducive to my mental stability! I’ve broken some of the ice around the bow, and it looks to be about an inch thick. We can cope with that. We should leave it till Thursday, letting another day of mildish weather work on the ice, but the forecast for the back end of the week is poor, so we’ll make it tomorrow. 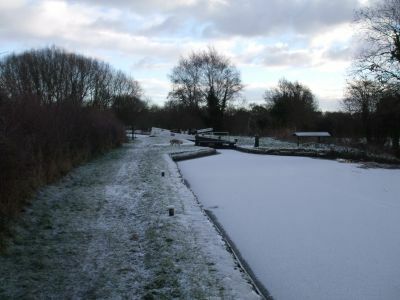 24 little hours with the temperature above freezing has melted the remaining frozen snow and just about cleared the towpath of ice. The odd stubborn patch is all that remains. Our black and white world has some colour again! The ducks will be relieved. There’ve been valiantly keeping a couple of leads open, they can relax for a while now. Reading the various boating blogs, the main cause for concern at the moment is emptying fresh water tanks, followed by filling loo tanks. Things you tend to take for granted if you live in a house. All being well those that are in dire straits will be able to make a dash for facilities after the weekend. The forecast indicates above zero temperatures for the next four days. Wow! 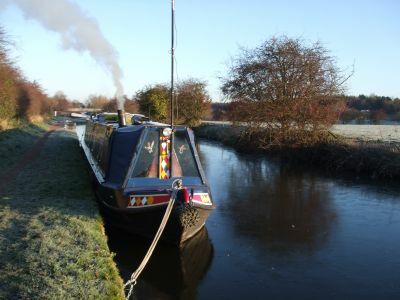 We’re OK, the service block is only 200 yards away, and Ian from across the canal on Tom’s Moorings kindly sent us a hose over the ice last night, so the water tank is full. If the ice looks like thinning here we may well move on to Gailey before the next spell of Arctic weather. 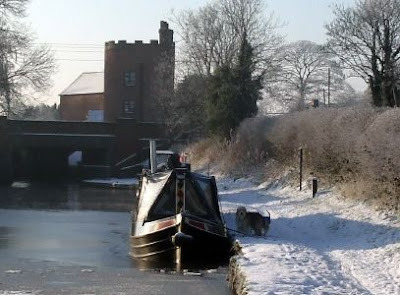 Penkridge is a fine spot to be stuck, but our next requirement will be for diesel fuel. Meg and I had a walk to Park Bridge again today, to Midland Chandlers. I’ve been filling the time making a new bathroom cabinet, and needed some varnish. I also came back with a 25 Lt water container, useful for bringing water back to an immobilised boat. Last January I was carrying six 2 Lt bottles in a rucksack ¾ mile each way, twice a day. I don’t want to do that again. We had company yesterday morning, Scooby and Rita off NB Festina Lente joined us for coffee. We had an enjoyable couple of hours nattering. It’s always amazing how small the boating community seems to be. We have several boating friends in common. 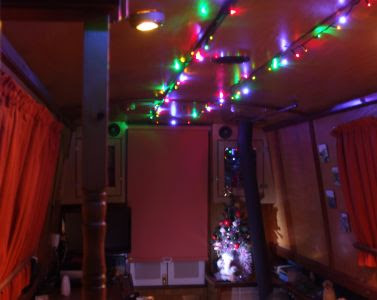 I wasn’t happy with the way I’d put up the Christmas lights, so I redid them yesterday. Down the middle instead of the sides. The towpath through the village is “interesting”. An inch of solid ice, the result of Saturday’s rain on top of Friday’s snow. It’s not so bad at night or first thing in the morning, but on sunny days like today a very thin film of water melts on the surface. Extremely good lubrication…. It’s the same principal as ice skates. 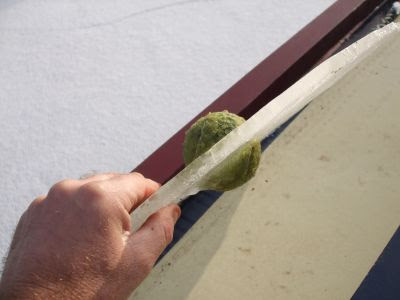 The passage of the blade over the ice melts it momentarily, giving almost zero friction. Yesterday morning was pretty cold, down to -10°. 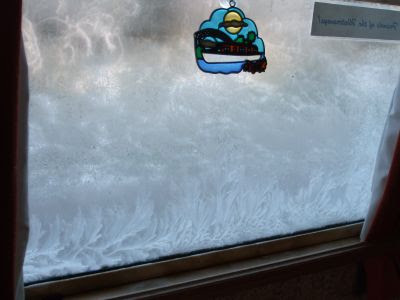 Ice on the inside of the windows behind the curtains. We’re pretty snug, “arctic mode” duvets on the bed, and Mags and Meg sharing the hot water bottle. I bought myself a fleece lined check shirt on the market, which Mags promptly purloined, so I’ve been up again today to get another. I picked up some LED fairy lights as well, so we’re all festered festive now. 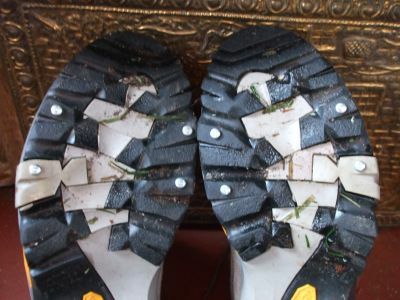 Sue has some non-slip soles to fit to her boots, like mini crampons. A good idea. I’ve come up with my own version…. Self tapping screws into the soles! They have to be newish boots, though. Watch out for the parquet floor! Locks 0, miles 0. Why do I bother? Well the mild weather over the weekend lasted all of one day. I was right about one thing though, it did bring rain! This turned the snow to slush, which was then converted to ice by the sub-zero overnight temperatures. Ann from NB Moore2Life walked over from Gailey on Saturday morning, and we toddled off into the village to the butcher and the market. I fixed Mags up with one of those Inca hats – Inca, not Himalayan as I said earlier. Still mountains though…. Very fetching. Thermal socks and a fleece lined lumberjack shirt for me, as well as a new blade for my bow saw. Today has been a bit grim. It’s stayed cold and misty all day, last night’s frost is still on the bushes. Meg and I had a walk back to Park Bridge to spend some money in Midland Chandlers. Came back with some loo blue, oil absorbent mats for the bilge, some hinges and a Canal Boat mag. 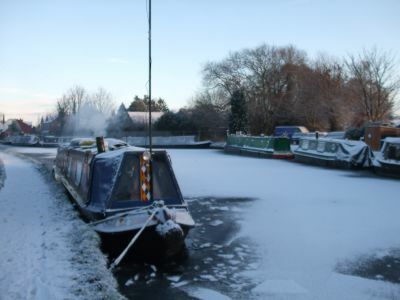 December’s issue has an article by fellow blogger Amy on NB Lucky Duck, about a trip earlier this year along The Backs in Cambridge. A good read, well done Amy. It looks like there may be a chance to get moving after next weekend. Another period of mild weather is due starting Thursday, hopefully lasting a little longer this time. With the weather set to change over the weekend, we may get a chance to move early next week. The wind direction is due to switch from the Siberian NE that we’ve got now, to milder air from the West. 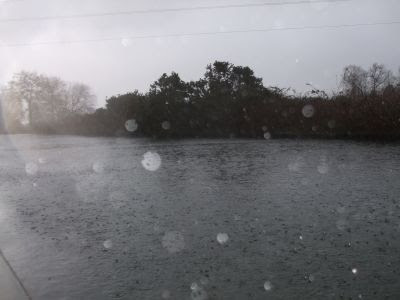 The only drawback is that westerlys usually bring rain. No pleasing me, is there! Meg and I had a very pleasant walk over to Gailey this morning to see Charles and Ann, (NB Moore2Life) and George and Carol (NB Rock ‘n’ Roll). Gailey, with the Roundhouse on the skyline. It had been another very cold night, and started out misty, but by mid-morning the sun had broken through, giving us another bright day. 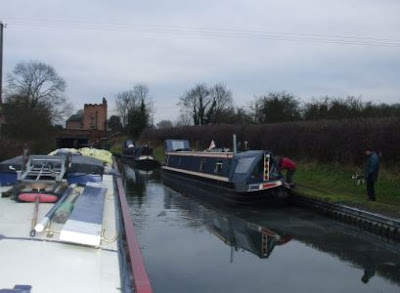 Yesterday, the two boats here at Gailey reversed up through the lock to fill water and fuel tanks at Gailey Wharf. 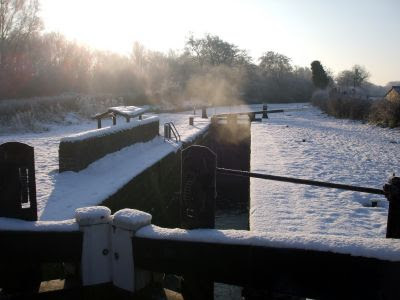 The bywash from the lock is keeping the water around them relatively ice-free, unlike our situation. We got back around 12:15, and after a cup of tea and a bite to eat, I did an engine oil change. It’s due next week, but I may as well do these jobs while we’re stuck. While warming up the engine to thin the oil I put it in gear to see if the propwash would break up the ice. It did, but not much. It looks to be about an inch thick at the edges, probably thicker in the middle. 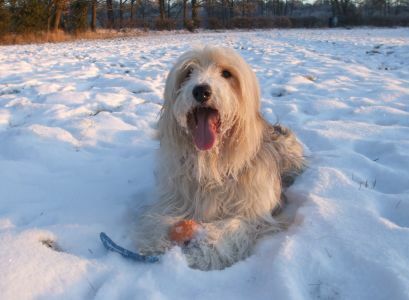 The operation did liberate one of Meg’s balls that she’d lost before the big freeze set in. Another look around the extensive Penkridge market tomorrow. Thermal socks for me and one of those oh-so-fashionable Himalayan woolly hats for Mags on the shopping list. I see the Liverpool Link Team have received an award. Well deserved. They made our trip last May very enjoyable. Locks 0, miles 0. Taking root. It’s been snowing on and off for most of the day today, Nothing particularly heavy, just blowing in the wind, really. With warmer temperatures during the day the stretches of open water below the locks are starting to get longer. If the weather stays the same we might have a chance after the weekend. It’s getting a bit tedious, now. 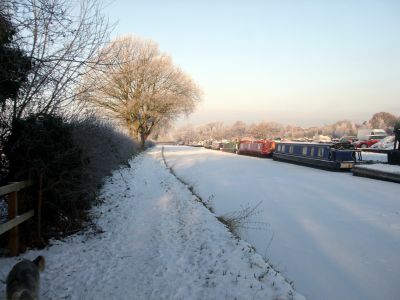 I’m running out of things to do inboard, and the snowy, busy towpath isn’t a suitable location for anything off the boat. Still, I guess we’re better off than some. Meg and I have also walked almost all of the footpaths with 1½ miles of where we are, so tomorrow we’re going further afield, up to Gailey to visit Moore2Life and Rock ‘n’ Roll. 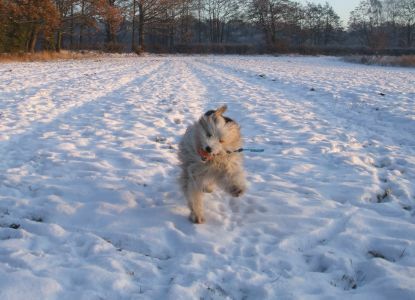 Meg is still enjoying herself, playing in the snow. Not everyone is locked in ice. I suppose if you’re desperate enough you have to go for it. Locks 0, miles 0. I’ll be glad when I can put some numbers in. Visitors, and full tanks and bunkers. December already! Where did the year go? Charles and Ann (NB Moore2Life) and George and Carol (NB Rock ‘n’ Roll) made the journey across from Gailey to Penkridge today. We couldn’t let them go back without seeing them, so they came to us for lunch. Home-made soup and mince pies, with a drop of something warming. Good stuff, good company. G & C have recently fitted one of those new Axiom props, and I quizzed them about it. They seem very satisfied with the improvement in handling, wash and noise. Sue and Vic are also pleased with theirs. I’m tempted. Have to see how the finances work out next year. Charles and Ann, George and Carol, and of course, Mags. I think Mags is telling Charles off about something…. And no, I hadn’t let the fire go out. They’d just got dressed ready to brave the elements when I thought of recording the event. 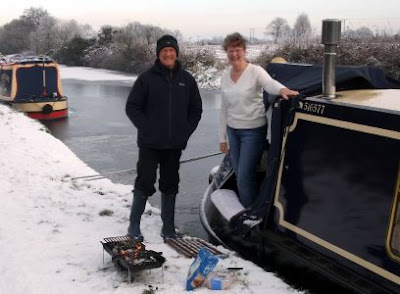 The coalman arrived while they were here, so I went up and unloaded at the lock, then wheeled two bags back to the boat, leaving the rest till after our guests had gone. 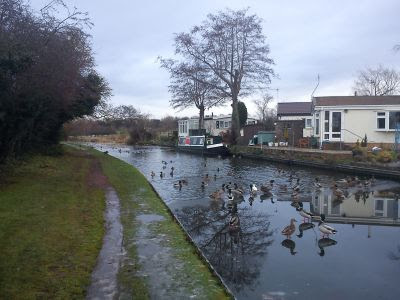 Meanwhile, Rita and Scooby on NB Festina Lente had been offered a water fill from a chap on NB Andromeda, on the permanent moorings on the opposite side of the canal. The hose came snaking across the ice, and they were soon filled up. Then we were offered the same hospitality, and accepted gratefully. It saved me having to start hauling my water bottles up and down the towpath tomorrow. It took the full length of his hose, plus our two, but we got there. So now we’ve plenty of solid fuel and a full water tank. Bliss. I think I mentioned the other day that the locals here are very friendly. This evening, out with Meg, I got chatting with a chap on the towpath, also dog-walking. 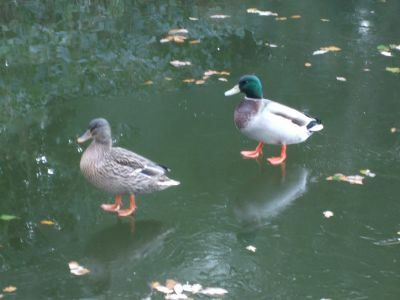 It turns out that he lives on the other side of the towpath, nearer the lock. Learning that we’re on a boat, frozen in, he told me that if ever we need anything, we just have to ask. How’s about that for a Good Samaritan! With the offer of assistance from Ray and Jayne on NB No Direction as well, this has restored my somewhat jaded faith in human nature. Still here…. Now we have snow. It’s warmed up a little over the last 24 hours, so the ice seems to be thinning a bit. The forecasted snow has arrived today, large fluffy flakes coming in on the NE wind. I might try to reverse back to the services tomorrow, it’ll make it so much easier to load the coal delivery when it arrives. 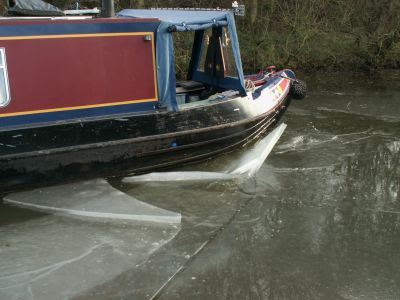 If I lash the tiller straight ahead, engage reverse on tickover and break the ice with the pole as we go…..
A friend of ours, John, left a comment the other day. The offer of company on Bruno’s last walk I may well accept. As far as the rest of the comment goes – I was under John’s parent’s kitchen sink, adapting the plumbing to fit a new tap. For better access the waste was removed. I’d caught some errant water in a dish and passed it up to John for disposal. I think you can guess where he poured it…… Yep, straight down the plug hole! And John, good luck with this year's Pickle Fest! 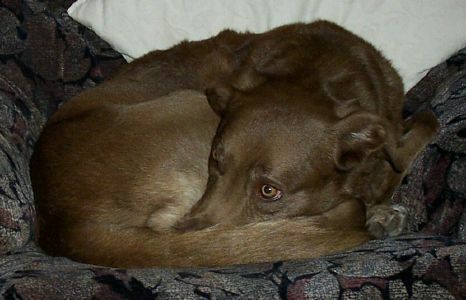 Mag’s grand-daughter, Melanie, still has three of the litter of labradors that her dog, Bess, had earlier in the autumn. 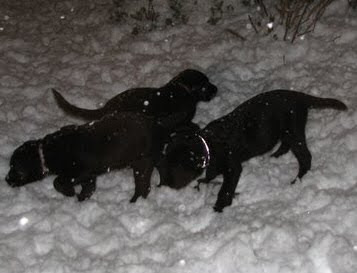 All three are black dogs, KC registered and of gundog parents. They’re up in Yorkshire. If anyone out there is interested, drop me a line or a comment and I’ll pass on your details. Wot’s this white stuff, Bro’? Totally unrelated, the Staffordshire Roaches near Leek are for sale. Part of the Peak District National Park, the gritstone outcrop was bought in an unusual move to protect access and the environment. The NP are now looking for a buyer, so that responsibility for maintenance is no longer a burden. The prospective purchaser will have to meet certain criteria, however, relating to access and conservation. It will still be part of the National Park. Organising for a longish stay. I’ve been on the phone today, setting us up for staying till after next weekend. I reckon it’s going to be that long before the canal is sensibly navigable. First off was a call to BW to tell them where we are and that we’ll be staying put for a while. 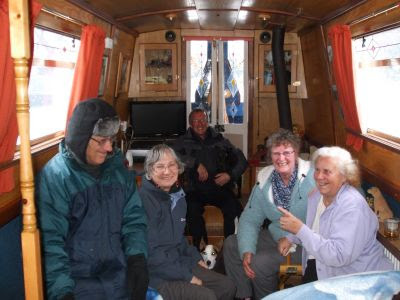 We’re on 48 hour moorings, you see, and have already been here 72! We don’t like overstaying, but in this case it’s unavoidable, and BW accept that. Two unsuccessful calls followed, both in an attempt to get some solid fuel. The first supplier I spoke to was apologetic, but with demand as it is couldn’t fit me in till next week. We’ll be icicles by then! The second just rang, so I left a message. Then I toddled off into the village, to arrange for the mail to be delivered to the Post Office here. Although they’re obliged to offer this service, as a matter of courtesy I always ask first. My phone rang while I was waiting in the queue, so I busied it then rang back when I got outside. It was Allens Fuels from Cannock replying to the message I left earlier. He’ll be able to deliver to the wharf on Wednesday, so that’s a weight off my mind. Ten bags of Taybrite, not my preferred product, but beggars can’t be choosers. I’ll have to be careful getting them to the boat, each bag has to be carried across the upper lock gate before I can barrow it to the boat. I wouldn’t want to fall in at the moment. We had a visitor this afternoon as I was oiling my wheels ready for Wednesday. A bit nearer the lock is another boat, NB Festina Lente. Rita was on her way to the shops and stopped for a chat on her way past. I’m sure we’ll see more of her and husband “Scooby” during the next few days…. Here’s an example of the unofficial support structure that operates within the boating community. Ray and Jayne on NB Travelling in No Direction left a message after yesterday’s post regarding finding some coal. They offered to bring some across to us by car if we’re stuck. Bear in mind that we’ve never actually met…. But that will be rectified in the future. Well, in common with just about everyone else on the water, we’re not going anywhere. 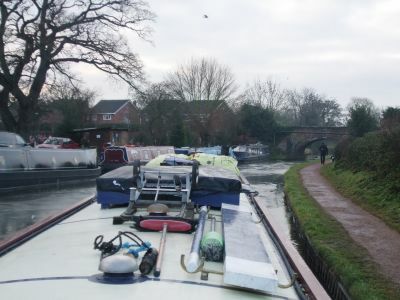 We’re on the 48 hour moorings at Penkridge, but I don’t think we’re going to be penalised for overstaying. We’ve not had much snow yet, just an inch on Friday night, but the temperatures have been well below freezing. We’re in a good situation here, far better than last January! We’re only 200 yards from the sani-station, and the village centre is less than 10 minutes away. I went up and had a look around the market on Saturday. It’s well worth a visit if you’re here, lots of stalls. The locals are friendly, used to boaters I guess. Meg’s already made several new chums, both human and canine. The only concern now is solid fuel. We used the last of the wood this morning, and are now down to 5 days worth of smokeless. I’ll be ringing round the coal merchants in the morning…. 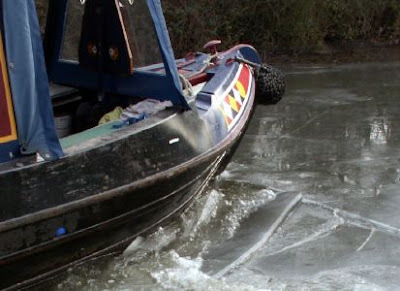 One boat arrived yesterday from the south, reporting variable thicknesses of ice up to Gailey. 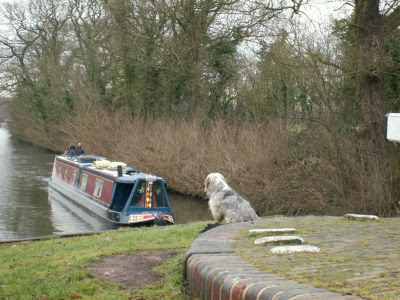 He moored a little nearer the lock and hasn’t moved on today. Nor has anyone else. 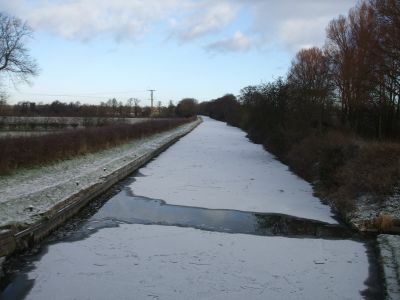 -5° last night left us with a frozen canal. 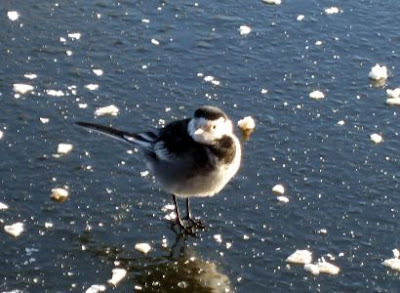 The bright sunshine soon cleared the frost off the grass but didn’t make a lot of impression on the ¼” of ice on the water. Cold outside, roaring fire inside. Meg and I had a walk up to have a look at Teddesley Park, a little way up the canal. The hall is no more having been demolished in the 50’s, but the stables and service blocks, once wings of the main structure, are still in use, just visible to the right of the picture. 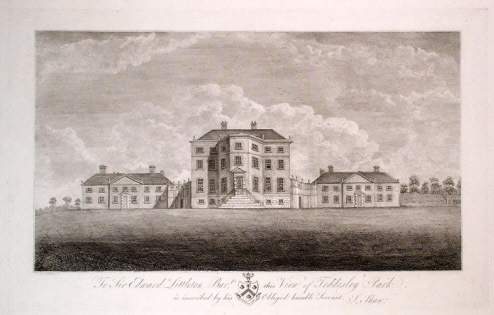 Teddesley Hall was built in the 18C, and was the home of the Littleton family until 1930 when the death of the then heir left it empty. It was taken over by the army during WWII, and was a POW camp for German officers, then reverted back to the family, before being sold along with the remaining 2,796 acres of parkland in 1953. It wasn’t known for it’s visual beauty, in 1789 it was described as 'rather deficient in the usual graces of architecture'. 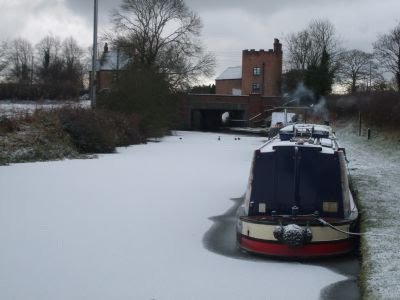 We made the short cruise into Penkridge at around midday, taking it gently through the ice. Up Penkridge Lock, a visit to the sani-station for water and the usual “offices”, then we pulled in on the visitor moorings in the middle of the village. Meg and I kept our appointment with the local vet, then had a walk along the towpath and back before stoking up the fire and sitting down to beef casserole and jacket potatoes. 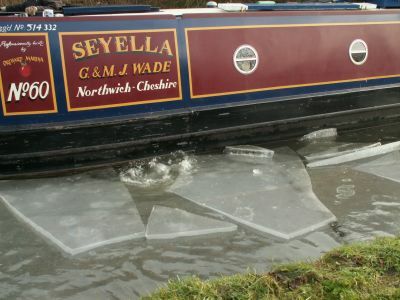 It’s supposed to be very cold again tonight, the open water we made on arrival has already frozen over. Resupplied and a short cruise. Nigel the Tescoman arrived at 11:00, but it was 12:15 by the time everything was stowed and we were ready to move on. A couple of boats had dropped down Park Gate Lock, leaving it empty and ready for us, but as soon as I started to get ready to go, a boat came up from behind. I could have pulled out and got into the lock before they arrived, but get annoyed if someone does that to me, so opened the gates and waved them in. As they were going up I pulled Seyella up onto the lock landing, then went and closed up for them as they left, before emptying the lock for us. 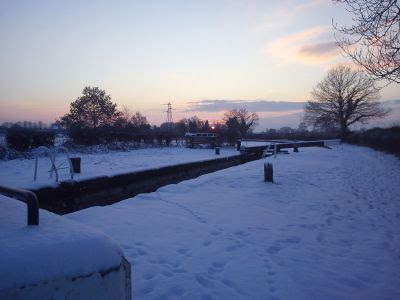 We decided not to go into Penkridge tonight, so pulled over just after going up Longford Lock. 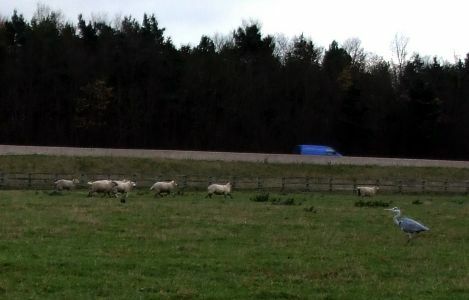 Heron, sheep stampede and M6. It’s 4 years ago yesterday since our last dog, Bruno, died. 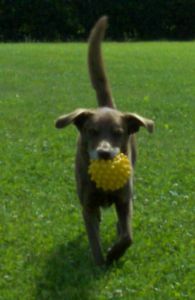 He’d only had just over 3 months with us on the boat when he started to have fits, followed by a massive stroke. 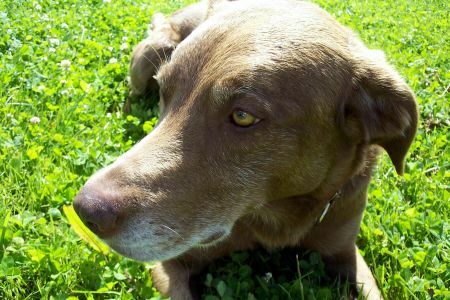 The vet diagnosed a brain tumour, and couldn’t do anything for him. 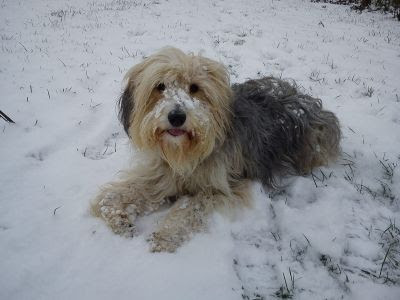 Most weekends we’d be up on the 3 Peaks in the Yorkshire Dales, and I’ve an abiding memory of him trotting along happily on the ridge up to Whernside, a blizzard blowing in from the right sheathing his fur in ice. It didn’t bother him at all. 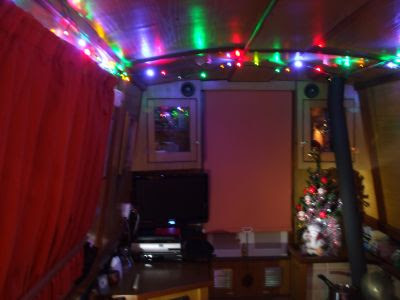 But he also liked his home comforts…. We’ve still got his ashes on board. I think when we’re in the Dales again we’ll have a last walk together up Whernside, and I’ll leave him up there. Less of this maudlin sentimentality.